Beautifully presented four bedroom family house in an idyllic rural hamlet within easy reach of local amenities, town centres and the New Forest National Park. 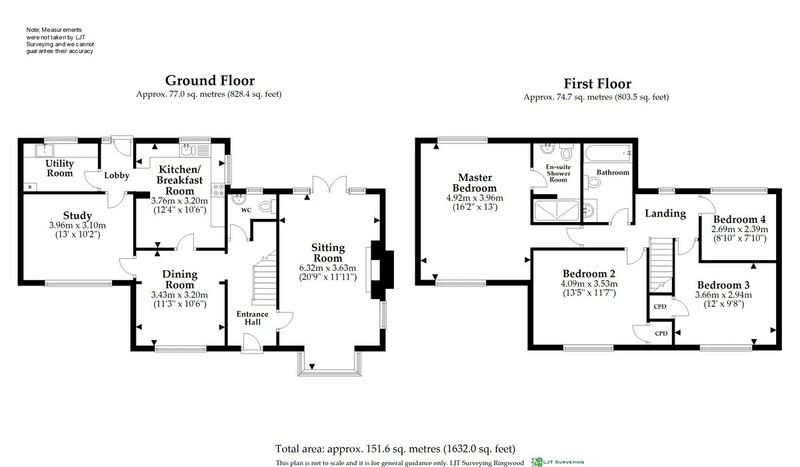 Triple aspect lounge, separate dining room, study, kitchen & utility room, master bedroom with ensuite, plentiful off road parking and detached double garage, private gardens front and rear with rural aspects. SUMMARY A beautifully presented four bedroom, three reception room detached family house in an idyllic rural hamlet within easy reach of local amenities, town centres and the New Forest National Park. The property was originally built approximately thirty-eight years ago, with a later two storey extension added by the present owners. The property presents mainly white colour washed brick faced elevations under a clay tiled roof with timber double glazed casement windows, and the property benefits from oil fired central heating. Internally the well planned accommodation is tastefully decorated throughout. Outside there is plentiful off road parking and a detached double garage and workshop, as well as private well stocked gardens front and rear. SITUATION The hamlet of Ripley is a rural community falling within the civil parish of Sopley, just outside of the New Forest National Park. Sopley Primary School is within strolling distance of the property, whilst Bransgore, which is about one and half miles away, offers a superb range of independent shops for day to day needs, including a co-op, post office, bakery and three dining/public houses. The larger centres of Ringwood, Christchurch and New Milton are approximately five/six miles away, the latter two offering mainline rail services to London Waterloo. As well as offering easy access to the New Forest, the property is also well placed for the coastal areas of Mudeford, Highcliffe and Lymington for beaches and boating activities. ACCOMMODATION Covered front entrance porch and step with coach light and hardwood front entrance door leads into the entrance hall with oak flooring, staircase with under stair recess rises to the first floor landing, cloakroom; low flush wc, vanity unit with cupboard beneath and tiled splash back, door from the entrance hallway leads into the sitting room; a triple aspect room (South, East & West), feature exposed rustic brick chimney breast with oak ‘bressummer style’ beam and recessed display niches, fitted wood burning stove, casement door with side panel windows provides direct access to the patio and rear garden. A doorway opening from the entrance hallway leads into an inner hall area with oak flooring, which then opens into the dining room; Westerly front aspect with some attractive feature rustic brick work and varnished exposed oak timber beam. A further door from the inner hallway leads into the study with a Westerly front aspect, oak effect floor covering, a further door then leads into the rear lobby; tiled flooring, hardwood external door provides access into the rear garden, and further doorway opening leads into the utility room and kitchen/breakfast room. The Kitchen/Breakfast room has ample laminated work surfaces with an inset Blanco stone composite one and a half bowl sink unit positioned beneath a casement window, offering views across the rear garden and fields beyond, beneath the work surfaces are a comprehensive range of hardwood Acaia cupboard and drawer units and space/plumbing for a dishwasher, integrated Indesit four ring induction hob and Bosch electric fan assisted oven, a multi-speed charcoal filter extractor canopy is located above the cooking appliances, in a housing to match a range of wall hung kitchen cabinets with pelmets, and which includes a worktop mounted glazed shelved glass cabinet, also space for a tall fridge freezer, tiled flooring, plenty of space for a breakfast table and four chairs, return door to the inner hall. A door from the aforementioned lobby, directly opposite the kitchen, also provides access to the utility room; beech work surfaces with butler style sink unit positioned beneath a casement window with garden views, cupboards and drawer unit beneath the work surfaces, matching wall hung shelved cupboards and bottle rack, floor mounted Grant oil fired central heating/hot water boiler, wall mounted LCD programmer for heating/hot water, space and plumbing for a washing machine/stacked tumble dryer, adjacent tall storage cupboard. The first floor is approached from the entrance hall with dado rail and white panelled doors leading to all rooms. The master bedroom has a Westerly and Easterly dual aspect with views across the garden and fields beyond, vaulted ceiling, oak flooring, two bedside wall lights, door to fully tiled ensuite shower room; fully tiled shower cubicle with glazed door and Mira 60 electric shower valve, contemporary style travertine wash hand basin and riser mono bloc mixer tap, backlit mirror above, circular low flush wc with concealed cistern and ‘Gerbit’ push button waste, wall mounted electric heated towel rail, extractor fan. Bedrooms two and three both have Westerly aspects towards the front, and are good sized double bedrooms with deep built in storage cupboards, and access to the attic space via a hinged trap hatch and Slingsby style ladder in bedroom three. Bedroom four is a large single bedroom with an Easterly aspect and views across the garden and fields. The family bathroom; part tiled, white three piece suite, panelled bath with mixer taps/shower attachment, glazed side screen, aquatronic electric shower valve, low flush wc with wooden seat, wash hand basin with ‘rises’ monobloc tap, oak cupboard and drawer unit beneath, electric heated towel rail, travertine effect vinyl tile floor covering, extractor fan. EXTERNALLY The front boundary is secured by low ranch style fencing and the front garden is well secluded by ground cover shrubs and ornamental trees. Double five bar gates provide access to a wide loose gravelled parking area, with ornamental street light, which leads to double width block work paved parking (35′ x17′), and a substantially built detached double garage and workshop beyond, with twin steel up and over doors and security light above, power and light. The main area of front garden lies adjacent to the aforementioned gravelled parking and is mainly laid to lawn. A timber screen gate from there leads into the rear garden, which is also accessed via an opening between the house and double garage. The beautifully sunny rear garden, which faces east, has a slab paved pathway leading to a sizeable paved patio, which then leads onto lawn bounded by well stocked flower and shrub borders. A timber garden chalet, currently used as a workshop, a timber garden shed/store and also a timber log store are also sited in the rear garden. The rear boundary is defined by evergreen hedging. Note; The owners currently rent a small area of land beyond their rear boundary, this arrangement has the potential to be carried on with the new owners. Use the form below to request a viewing for this property. We'll contact you to confirm within 24hrs. Fells Estate Agents Ringwood is a friendly and professional Estate Agent on the edge of the New Forest National Park with their Market Town office in Ringwood. With over 75 years combined experience in selling property in the New Forest and surrounding areas, Fells New Forest Property are the number one choice for your property needs whether you are buying or selling in Hampshire and Dorset. What’s happening to Ringwood property prices? Copyright © 2019 Fells New Forest Property.